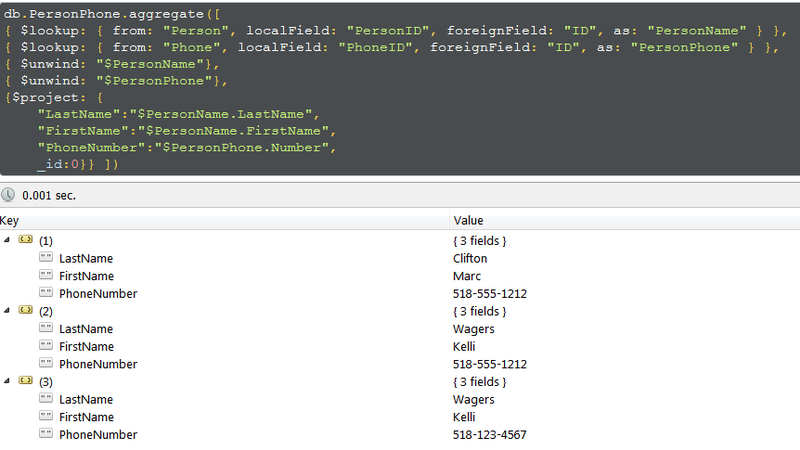 I’m a SQL guy — relational databases are the cat’s meow, in my opinion. I’ve never been enamored with NoSQL databases because many of the kinds of data I’ve worked with over the years are inefficiently expressed in a denormalized document database. 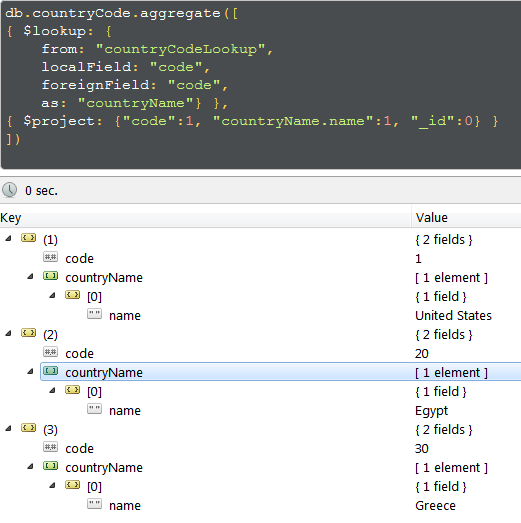 None-the-less, I occasionally take a look at what is going on in the NoSQL world, and was surprised to discover that as of MongoDB 3.2, released in December 2015, there is now a $lookup aggregator that supports left outer joins (one to many) of two collections. This was very attractive to me because, in my work with creating a semantic database using a relational database, there were aspects of NoSQL that were very attractive, schema-less being the main one. 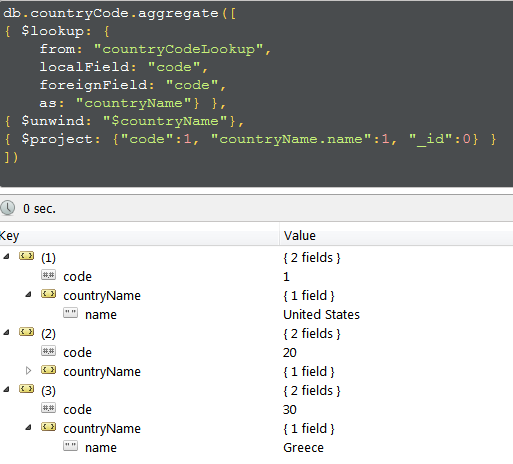 However, the inability to relate two NoSQL collections except through client-side filtering, was a show stopper for me. Well, not so anymore. While I’m working on an article (which will get published shortly) for implementing a semantic database in MongoDB, I thought I’d write something specifically about using the new $lookup aggregator and the things I’ve learned working with it. Using a document model does not mean that joins aren’t useful. There’s no question that when data is being used for reporting, business intelligence, and analytics, joins are effective. The relational database model has several theoretical merits, but also many real-world limitations, chiefly the need to join data together across tables. Joins impede performance, inhibit scaling, and introduce substantial technical and cognitive overhead into all but textbook examples. Wow, really? In my opinion, I think this demonstrates a lack of understanding of a normalized database schema! As such, it is offered as part of our MongoDB Enterprise Advanced subscription. Our philosophy continues to be that documents are the right model for application development. While denormalization of data often ends the need for mindless fracturing and re-assembling of stored objects (as is common in the relational world), there are valid use cases for joins, even in MongoDB…MongoDB’s choice to create an Enterprise-only pipeline operator, against the wishes of some in the open source community, will be an interesting decision to watch unfold. Two weeks ago I announced that the new aggregation pipeline stage $lookup (a limited left-outer join operator) would be a feature available only in MongoDB Enterprise Advanced Server. Our rationale was that we viewed $lookup as an enabler of other Enterprise features and we were concerned that widespread availability of $lookup in the Community Edition would lead to users treating MongoDB like a relational database. Nonetheless, one thing is clear: this surprised our users unpleasantly, which is something we never want to do. We hear you. $lookup is going to be a community feature. Finding the principle that makes sense of this decision (and which can guide and explain future choices) is important to us, but not as important as the confidence of our community. We’re still concerned that $lookup can be misused to treat MongoDB like a relational database. But instead of limiting its availability, we’re going to help developers know when its use is appropriate, and when it’s an anti-pattern. The below post is outdated. 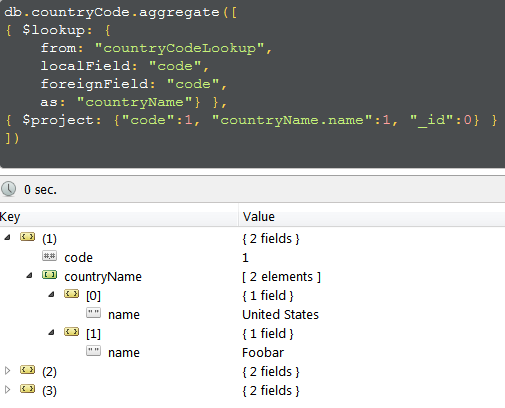 MongoDB shipped the $lookup operator with MongoDB Enterprise Advanced and its community version. We are thrilled to see that MongoDB revisited the decision. This demonstrates how it cares about the community and values their feedback, and this, in turn, goes a long way towards building and maintaining the kind of trust necessary to fully commit to the open source project for the long run. Optionally download and install RoboMongo, so you can inspect your collections in a nice GUI. I’m not going to debate the pros and cons of a document vs. relational database here. Both have their strengths and weaknesses. What this article is about is how to use the $lookup aggregator should you determine that you need relationality between two collections. 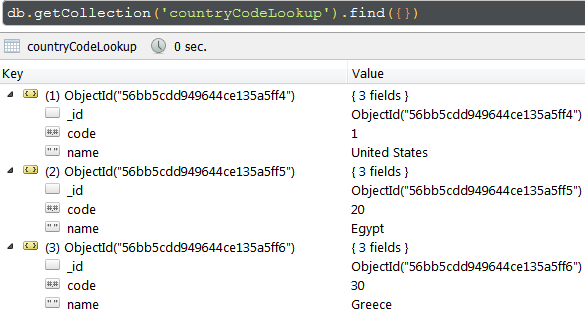 Let’s take a basic,overly simple, example, one in which one collection holds a code (we’ll use telephone country codes as an example) and the other collection which is a lookup table matching the code to a country name. 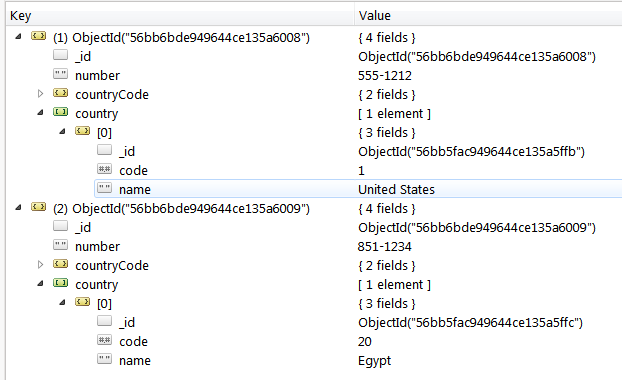 So now we have a nicely formatted one-to-one set of documents, effectively recreating what one could do a SQL view that joins one table with a second lookup table. 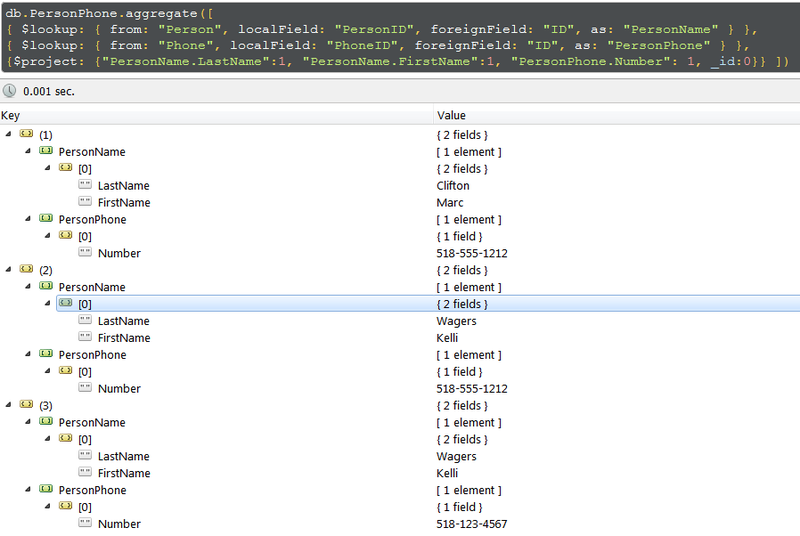 Note that I’m using my own ID’s here, which is purely illustrative, it makes it easier to write the test examples, but this technique works equally well with the object ID “_id” field. It took me a bit find that solution! The $lookup aggregator adds the ability to create normalized documents in the Mongo NoSQL paradigm. In my opinion, this is a really useful feature, as it pushes to problem of relating collections to the server, where theoretically (I can use that work too, Eliot!) one can take advantage of indexing and other performance improvements. Not to mention that the data that has to be brought down to the client to otherwise relate two or more collections is significantly reduced. In general, I’ve really enjoyed my first real exploration into MongoDB. The aggregator pipeline is quite fun to work with, and I’m very pleased that the ability to relate two or more collections now exists in MongoDB. On records on the same database — you cannot perform lookups across databases. It would be interesting to see if these two limitations are ever overcome. But the whole issue of ACID and transactions is a completely separate topic!